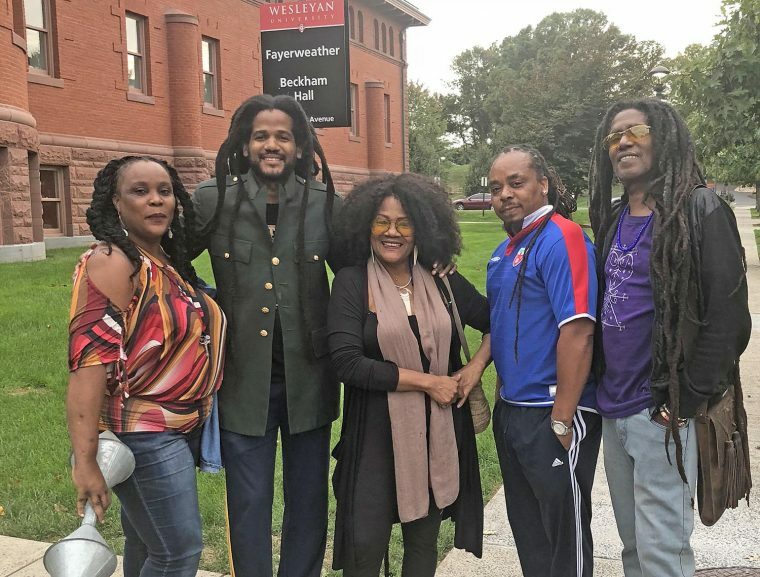 Boukman Eksperyans band members toured Wesleyan while visiting campus Sept. 20-21. 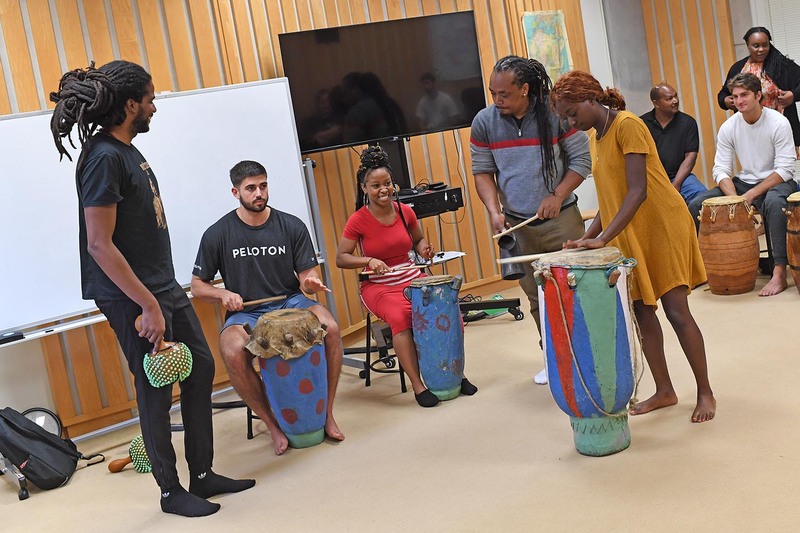 On Sept. 20-21, core members of the Grammy-nominated Haitian “roots” band Boukman Eksperyans, along with the band leaders’ son Paul Beaubrun (band leader of Zing Eksperyans), engaged with several groups on campus. 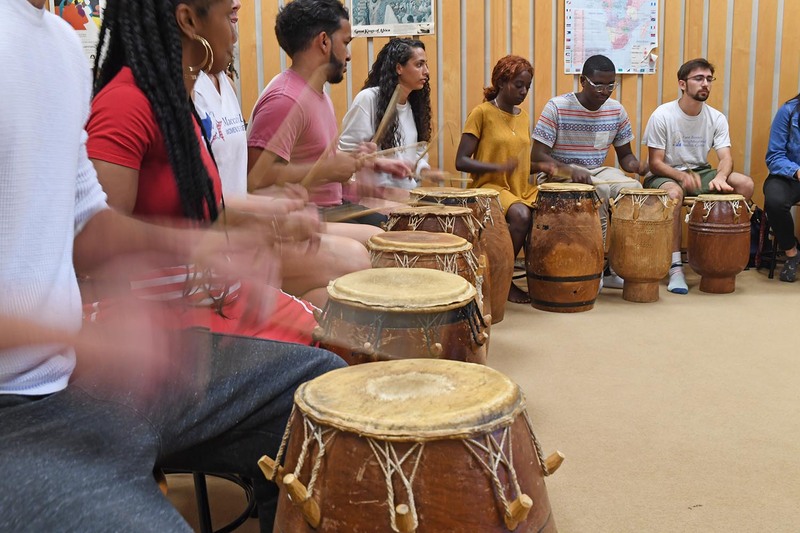 Boukman, founded in 1978, is one of Haiti’s best-known bands and performs traditional Vodou rhythms with pop, reggae, and blues. 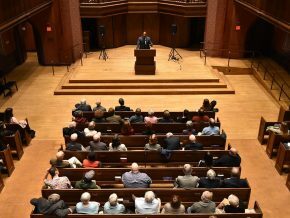 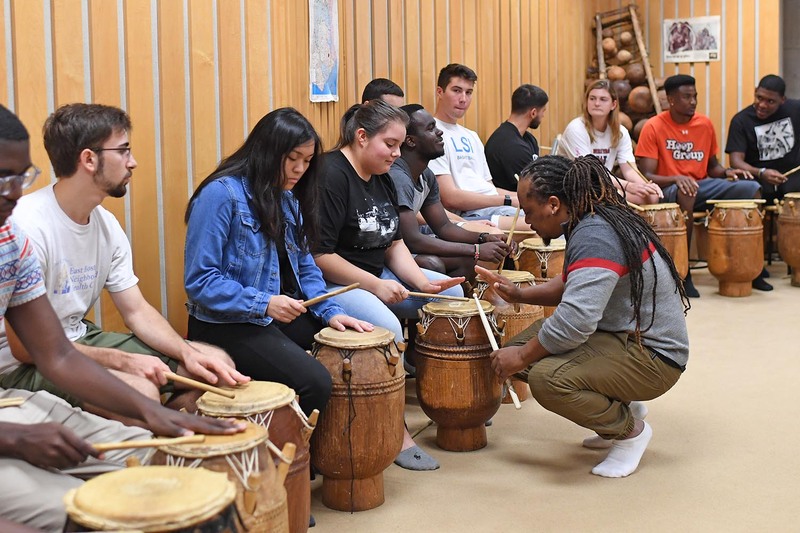 After learning that the group was touring between Brooklyn, N.Y., and Montreal, Canada, faculty from African American Studies and the Music Department invited and coordinated their visit at Wesleyan. 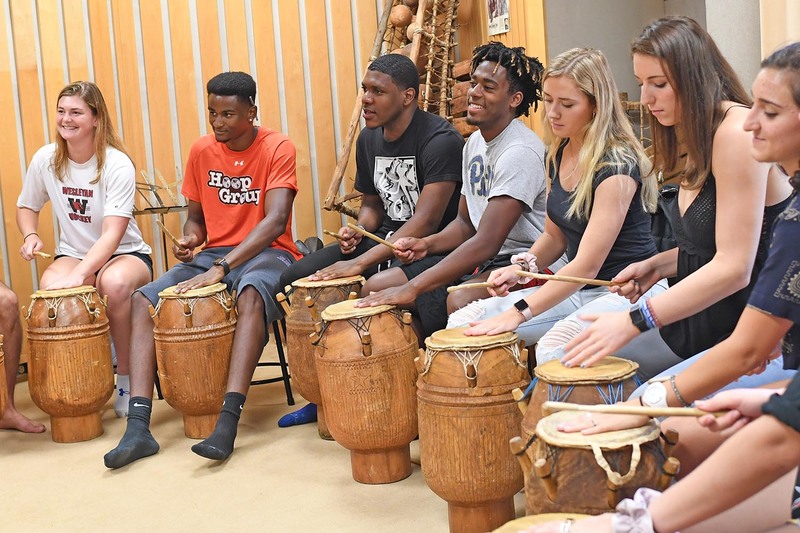 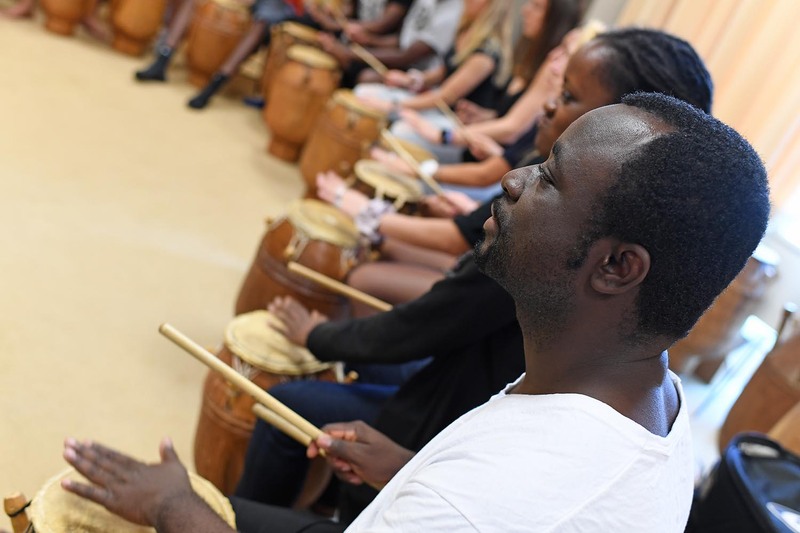 On Thursday, band members led a workshop for students enrolled in the West African Music and Culture course, taught by John Dankwa, adjunct assistant professor of music. 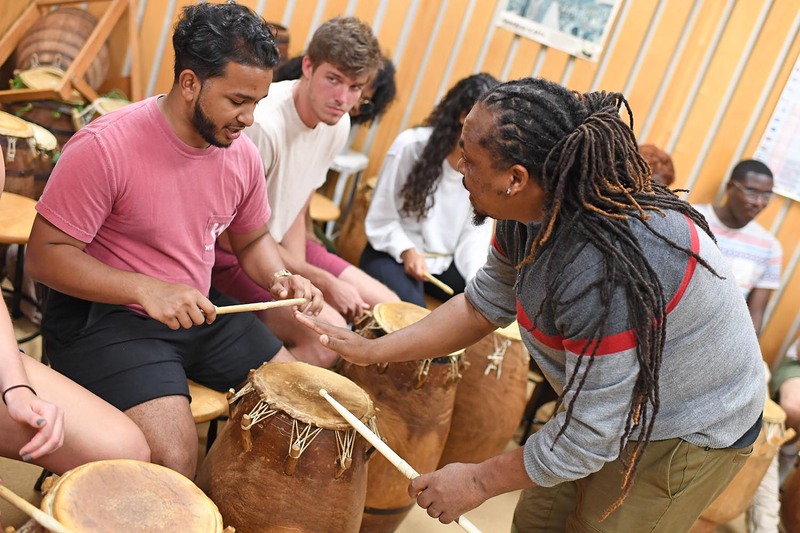 Boukman Eksperyans’ drummer Hans Dominique, known as “Bwa Gris,” taught the students about traditional Haitian drumming and rhythm. 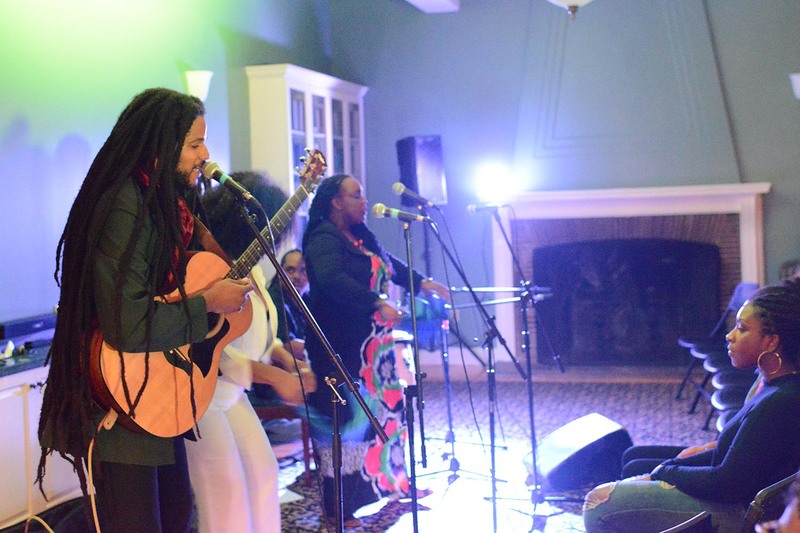 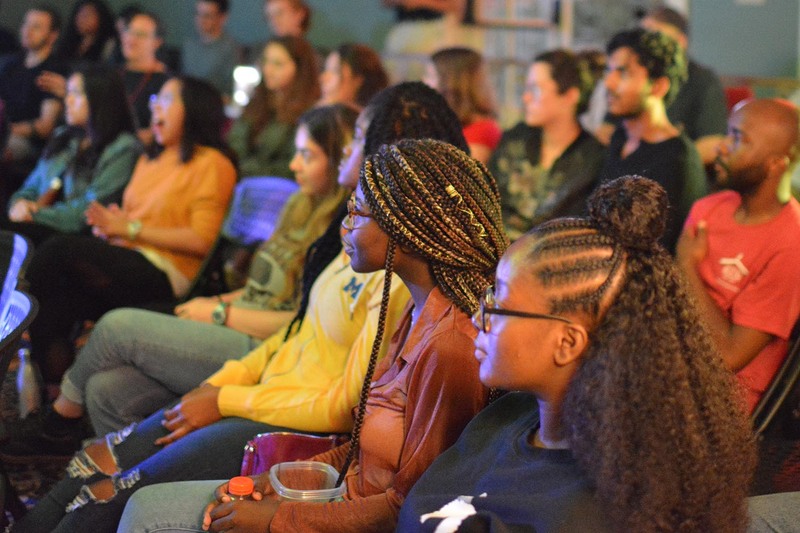 Later that evening, the group performed an acoustic set in Downey Lounge, bringing to Wesleyan their distinctive style that fuses the traditional rhythms of Afro-Haitian religion (known as Vodou) with rock and reggae. 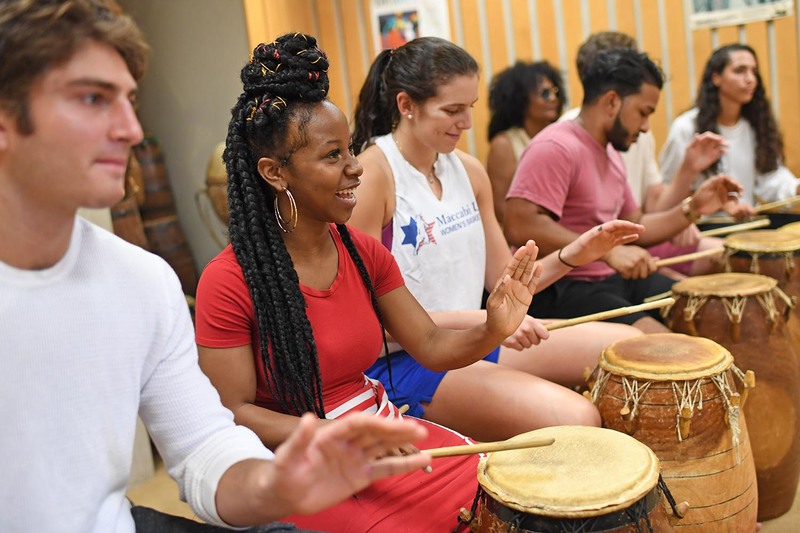 Singing in the Haitian Kreyol language, they bring attention to the different ways of knowing and living in the Caribbean. 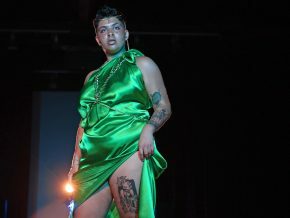 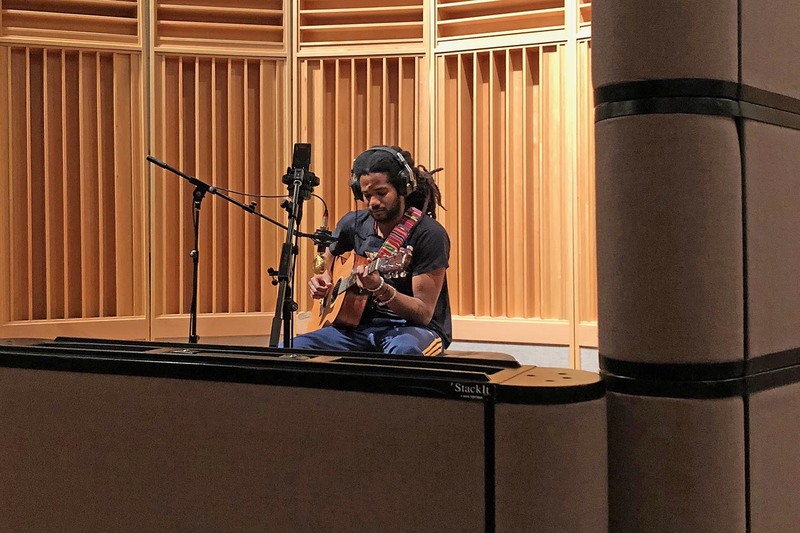 The younger Beaubrun has been bringing the family tradition in new directions, performing as the opening act for Lauren Hill’s latest tour. 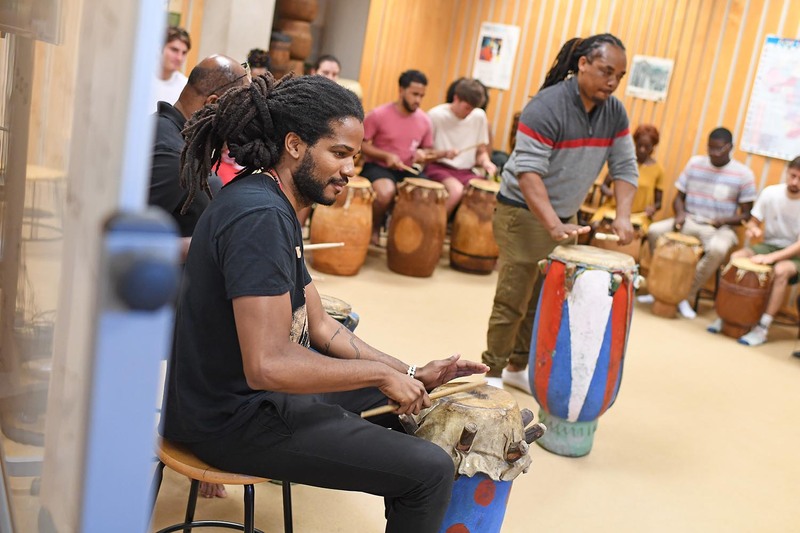 They are also celebrating the release of Paul Beaubrun’s new album “Ayibobo” on Ropeadope Records. 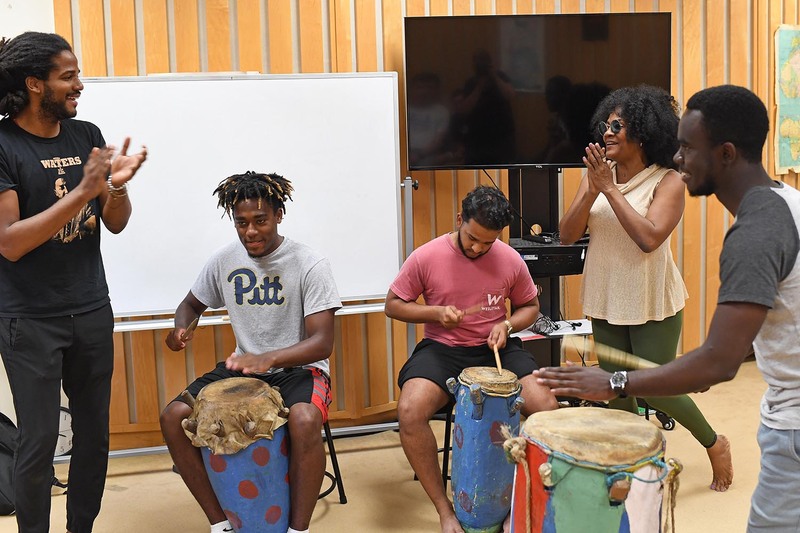 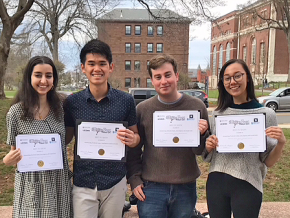 On Friday, the musicians worked with students from the Music Department’s experimental music and sound design programs to record new tracks in the Music Department’s recording studio.